The Thirteenth Judicial District Commission on Judicial Performance unanimously recommends that Judge Douglas R. Vannoy BE RETAINED. 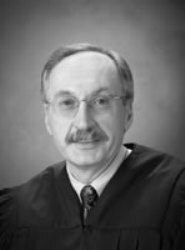 Judge Vannoy graduated from Colorado State University in 1973, and he earned a Juris Doctor degree from the University of Denver College of Law in 1976. Before being appointed to the Thirteenth Judicial District Court Bench in 1988, Judge Vannoy was a private attorney in general practice. Judge Vannoy’s professional activities include teaching jury management at the Advanced New Judge’s Orientation, and he facilitates quarterly “Best Practices” meetings for stakeholders in juvenile-court cases. Also, Judge Vannoy is a 4-H volunteer, and he is a member of the Morgan Saddle Club. Previously, Judge Vannoy served on a committee involved with the Cross-Over Youth Project in Morgan County. Evaluation methods used by the commission included reviews of judicial performance survey reports. Those reports contained summaries of responses to survey questions and comments from attorneys and non-attorneys who had been involved in proceedings in Judge Vannoy’s courtroom. The non-attorneys surveyed included civil litigants, criminal defendants, jurors, witnesses, crime victims, court staff, interpreters, and probation and law enforcement officers. The evaluation process also involved review of the Judge’s written self-evaluation, review of a sample of the Judge’s written decisions, courtroom observations by some members of the commission and an interview with the Judge. Of the attorneys surveyed about retention, 77% recommended retaining Judge Vannoy, 4% recommended not to retain, and 19% made no recommendation. Of non-attorneys surveyed, 81% recommended retaining Judge Vannoy, 9% recommended not to retain, and 10% made no recommendation. Based on the survey results of attorneys, Judge Vannoy received an overall rating slightly below the overall average rating of all district judges standing for retention. Judge Vannoy’s overall rating based on the survey results of non-attorneys, while high, is somewhat lower than the overall average rating of all district judges standing for retention. Judge Vannoy received high marks in case management, application and knowledge of law, communications, and diligence. Some who took the survey noted Judge Vannoy to be impatient at times; however, this is often in relation to parties or attorneys who may be unprepared or who may be pursuing matters not relevant to the proceeding.